March 4, 2004  Jerry Douglas has played the dobro — a type of slide guitar — on over 1,000 albums. He tells of falling in love with the sound of the dobro even before he knew what it was. 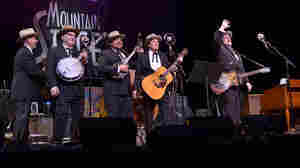 May 12, 2015  The group conjures up the sounds of bluegrass legends Lester Flatt and Earl Scruggs. November 3, 2008  The Dobro master has appeared on countless recordings and collaborated with the upper echelon of country and bluegrass musicians. But his taste and talent don't exist only in the realm of those genres, as Douglas has played and recorded with the likes of Ray Charles, Paul Simon and Elvis Costello and Eric Clapton. November 6, 2005  When a musical group needs a dobro guitar player, Jerry Douglas is the go-to guy. Douglas can be heard on some 1,500 recordings. Occasionally, he breaks out to make his own records. His latest is called The Best Kept Secret.